In The Art of Learning Josh reveals his unique systems of thematic learning, idea generation, building resilience, and mastering the art of performance psychology. A public figure since winning his first National Chess Championship at the age of nine, Waitzkin was catapulted into a media whirlwind as a teenager when his father's book Searching for Bobby Fischer was made into a major motion picture. After dominating the scholastic chess world for ten years, Waitzkin expanded his horizons, taking on the martial art Tai Chi Chuan and ultimately earning the title of World Champion. How was he able to reach the pinnacle of two disciplines that on the surface seem so different? "I've come to realize that what I am best at is not Tai Chi, and it is not chess," he says. "What I am best at, is the art of learning." Josh discusses chess, martial arts, and ideas from his book, The Art of Learning. "Absolutely brilliant immersion into the phenomenon of human mastery. 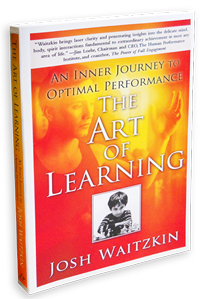 Waitzkin brings laser clarity and penetrating insights into the delicate mind, body, spirit interactions fundamental to extraordinary achievement in most any area of life. This is a journey worth taking." "Josh Waitzkin's The Art of Learning is a testimonial to the timeless principle of "do less and accomplish more. Highly recommended for those who want to understand the power of consciousness."